Newspaper editors are deeply concerned about the declining quality of journalism in this country. So says a report, Journalism at the Speed of Bytes, published by the Australian Research Council and the Walkley Foundation, based on a survey of 100 newspaper editors and senior editorial staff. The report aimed to examine “how much pressure the digital revolution was putting on … ‘journalism’s democratic imperative’ — producing high quality, relevant content that keeps the public informed of issues of importance”, according to The Australian. But even as they fret about quality, editors are more worried about ensuring their staff have monetisable digital media skills than about hiring journalists who can write. 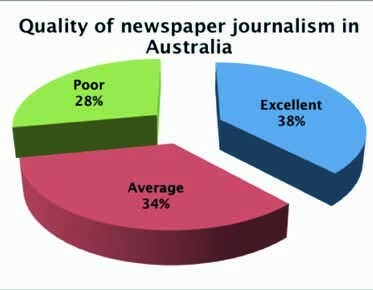 Just under two-thirds of editors surveyed said the current quality of Australian printed newspaper journalism was poor (28%) or average (34%). They rated the quality of online journalism similarly, 29% poor and 38% average. Tellingly, 38% of newspaper journalists rated newspaper journalism as excellent, while only 14% thought there was excellent online reporting. The report contains some terrifying signals about the powerful reality distortion field in which newspaper editors live. 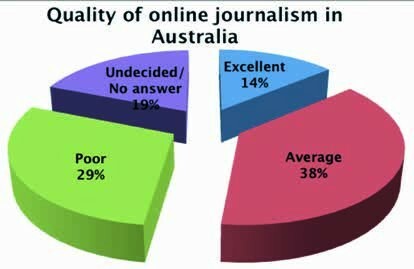 For example, it says 17% of editors “were reluctant to pass judgment [on the quality of online reporting], saying digital journalism has yet to establish itself in Australia”. Exsqueeze me? And a full third (34%) of editors are still buying the hype about tablet devices. They “described the tablet as a ‘game-changer’ because it is journalist-friendly (adaptable to known news cycles, formats and values), reader-friendly (adaptable to known consumer preferences and habits) and financially viable because the content is seen to be more readily monetised”. I can promise you, the only words in that sentence these editors care about are ‘financially viable’ and ‘monetised’. This report about the newspaper industry, funded and published by the newspaper industry’s cheer squad, was overly kind to the newspaper industry in other ways. In the foreword, former Sydney Morning Herald editor Amanda Wilson writes “there has been some erosion in public trust in news media”. Isn’t it funny how the only time the mainstream media can be so understated is when it comes to self-reflection? Wilson says people trust the media less because “the 24-hour news cycle has collided with shrinking resources and the traditional view of what constitutes news versus opinion versus advertorial is increasingly blurred”. She attributes the fuzziness to “the need for profits” and “newcomers in the digital space: bloggers, social media, content farmers, etc”. So, it isn’t really the newspapers’ fault, it’s the evil bloggers and social media again. The report also says “The hypercritical online culture has created problems of trust and value”. Of course, newspapers publishing more and more hastily written, error-filled and fact-unchecked, click-baiting, sensationalist, opinion-dressed-as-reporting, poorly spelled and grammatically dubious online articles has nothing to do with it. But here’s the kicker. Editors looking to recruit new journalists were almost twice as likely to seek candidates with digital media skills (46%) over writing skills (28%). In fact, an ability to write came in at number five on the editors’ list of desirable skills. Perhaps in the olden days, when newspapers maintained armies of sub-editors to iron out journalists’ wrinkly prose and correct or query factual errors before they went to print a day later, this might have been acceptable. And we’re seeing the results, every day, in the growing number of typos, factual errors, mangled sentences and he-said-she-said cut-and-paste jobs in stories newspapers publish online. If editors’ primary criterion for hiring new journalists is ‘good at Twitters and iPads’ rather than ‘can write coherent sentences’, the only way is down for quality journalism. 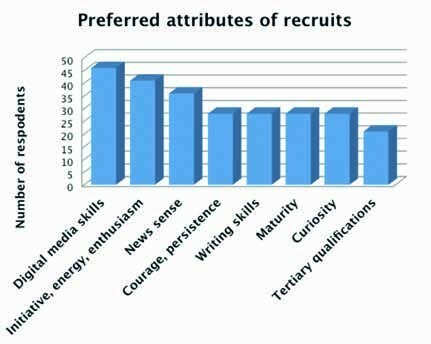 I take it from those graphs that statistical skills does not rate a mention as a recruit attribute? Take the “quality of newspaper journalism in Australia” one. First, an 3D exploding pie chart, really? Second, take away the percentages on the parts of the pie, which is the largest? To me, “average” looks like a higher value than “excellent”. For “preferred attributes of new journalists”, it should be tilted on it’s axis to be horizontal so the values of each column are more legible. Also, being in 3D makes it hard to properly work out exactly what each value is, it should be kept as 2D. Perhaps as well a bit more granular to work out the differences between: courage, writing, maturity and curiosity. In saying that, writing looks very similar to courage. You could say writing is equal fourth, rather than fifth. From the little I know about statistics, what I do know is that statisticians enjoy taking the piss out of journalists as much as writers do!